The question of ergodicity in a perfectly collisionless ideal gas with specular reflections. 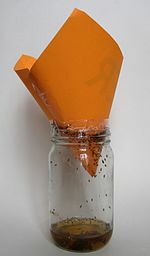 This device can trap fruit flies, but if it trapped atoms when placed in gas that already uniformly fills the available phase space, then both Liouville's theorem and the second law of thermodynamics would be violated. In physics and thermodynamics, the ergodic hypothesis says that, over long periods of time, the time spent by a system in some region of the phase space of microstates with the same energy is proportional to the volume of this region, i.e., that all accessible microstates are equiprobable over a long period of time. Liouville's Theorem states that, for Hamiltonian systems, the local density of microstates following a particle path through phase space is constant as viewed by an observer moving with the ensemble (i.e., the convective time derivative is zero). Thus, if the microstates are uniformly distributed in phase space initially, they will remain so at all times. But Liouville's theorem does not imply that the ergodic hypothesis holds for all Hamiltonian systems. Assumption of the ergodic hypothesis allows proof that certain types of perpetual motion machines of the second kind are impossible. In macroscopic systems, the timescales over which a system can truly explore the entirety of its own phase space can be sufficiently large that the thermodynamic equilibrium state exhibits some form of ergodicity breaking. A common example is that of spontaneous magnetisation in ferromagnetic systems, whereby below the Curie temperature the system preferentially adopts a non-zero magnetisation even though the ergodic hypothesis would imply that no net magnetisation should exist by virtue of the system exploring all states whose time-averaged magnetisation should be zero. The fact that macroscopic systems often violate the literal form of the ergodic hypothesis is an example of spontaneous symmetry breaking. However, complex disordered systems such as a spin glass show an even more complicated form of ergodicity breaking where the properties of the thermodynamic equilibrium state seen in practice are much more difficult to predict purely by symmetry arguments. Also conventional glasses (e.g. window glasses) violate ergodicity in a complicated manner. In practice this means that on sufficiently short time scales (e.g. those of parts of seconds, minutes, or a few hours) the systems may behave as solids, i.e. with a positive shear modulus, but on extremely long scales, e.g. over millennia or eons, as liquids, or with two or more time scales and plateaux in between. Ergodic theory is a branch of mathematics which deals with dynamical systems that satisfy a version of this hypothesis, phrased in the language of measure theory. ^ The introduction of the practical aspect of ergodicity breaking by introducing a "non-ergodicity time scale" is due to Palmer, R. G. (1982). "Broken ergodicity". Advances in Physics. 31 (6): 669. Bibcode:1982AdPhy..31..669P. doi:10.1080/00018738200101438. . Also related to these time-scale phenomena are the properties of ageing and the Mode-Coupling theory of Götze, W. (2008). Dynamics of Glass Forming Liquids. Oxford Univ. Press.